(Nanowerk News) Water was crucial to the rise of life on Earth and is also important to evaluating the possibility of life on other planets. Identifying the original source of Earth's water is key to understanding how life-fostering environments come into being and how likely they are to be found elsewhere. New work from a team including Carnegie's Conel Alexander found that much of our Solar System's water likely originated as ices that formed in interstellar space. Their work is published in Science. Comets and asteroids in particular, being primitive objects, provide a natural "time capsule" of the conditions during the early days of our Solar System. Their ices can tell scientists about the ice that encircled the Sun after its birth, the origin of which was an unanswered question until now. In its youth, the Sun was surrounded by a protoplanetary disk, the so-called solar nebula, from which the planets were born. But it was unclear to researchers whether the ice in this disk originated from the Sun's own parental interstellar molecular cloud, from which it was created, or whether this interstellar water had been destroyed and was re-formed by the chemical reactions taking place in the solar nebula. "Why this is important? If water in the early Solar System was primarily inherited as ice from interstellar space, then it is likely that similar ices, along with the prebiotic organic matter that they contain, are abundant in most or all protoplanetary disks around forming stars," Alexander explained. "But if the early Solar System's water was largely the result of local chemical processing during the Sun's birth, then it is possible that the abundance of water varies considerably in forming planetary systems, which would obviously have implications for the potential for the emergence of life elsewhere." In studying the history of our Solar System's ices, the team—led by L. Ilsedore Cleeves from the University of Michigan—focused on hydrogen and its heavier isotope deuterium. Isotopes are atoms of the same element that have the same number of protons but a different number of neutrons. The difference in masses between isotopes results in subtle differences in their behavior during chemical reactions. As a result, the ratio of hydrogen to deuterium in water molecules can tell scientists about the conditions under which the molecules formed. For example, interstellar water-ice has a high ratio of deuterium to hydrogen because of the very low temperatures at which it forms. Until now, it was unknown how much of this deuterium enrichment was removed by chemical processing during the Sun's birth, or how much deuterium-rich water-ice the newborn Solar System was capable of producing on its own. So the team created models that simulated a protoplanetary disk in which all the deuterium from space ice has already been eliminated by chemical processing, and the system has to start over "from scratch" at producing ice with deuterium in it during a million-year period. They did this in order to see if the system can reach the ratios of deuterium to hydrogen that are found in meteorite samples, Earth's ocean water, and "time capsule" comets. 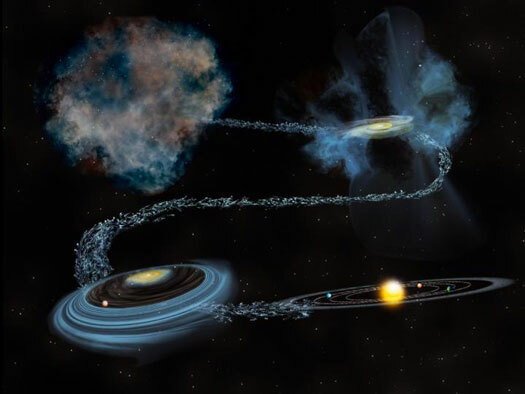 They found that it could not do so, which told them that at least some of the water in our own Solar System has an origin in interstellar space and pre-dates the birth of the Sun. "Our findings show that a significant fraction of our Solar System's water, the most-fundamental ingredient to fostering life, is older than the Sun, which indicates that abundant, organic-rich interstellar ices should probably be found in all young planetary systems," Alexander said.